Lunar or Chinese New Year is one of the biggest holidays celebrated by many Asian cultures around the world. It is a time of family reunion and renewal of life as another new and hopeful year is welcomed in joyful celebrations and festivities. Bring in the good luck and good fortune by decorating your home with beautiful Asian home accessories and decorations, featuring red and gold colors. Our huge selection of tablewares, ranging from the Chinese Calligraphy and Poem collection to the enchanting Maroon Lucky Chinese Floral Motif Asian Table Runner, will certainly impress everyone at your reunion dinner. Add a final touch to your Lunar New Year table with Red Ceramic Soup Spoon, Longevity Red Chopsticks, or Fortune Cookie Chopsticks Rest. 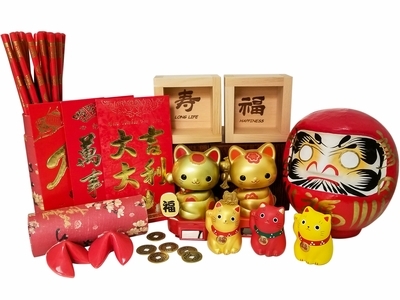 Don�t forget to share the luck with your loved ones by gifting them some of our best quality good-luck items such as Daruma dolls, Maneki Neko or jade charms. During Lunar New Year, lucky red envelopes are must-have to give out to friends and family as the red color represents good energy, happiness and prosperity. Those who receive a red envelope are wished to have a lucky and joyful new year. With this gift guide, our team at Mrs. Lin�s Kitchen hopes to help you prepare for an enjoyable and cheerful Lunar New Year. May this Lunar New Year bring you and your family prosperity, good luck and good fortune!